My friend was 7 or 8 months pregnant when she quietly called to say she was slipping away with her little family to have a secret Christmas trip in Orlando. It was secret only due to her history of complicated pregnancies and being so late in term. We lived in South Florida at the time so of course we made arrangements to meet up! We had no way of knowing that the 26th of December would be in the lower 40's with wind and rain - a horror story for Floridians! We still bravely drove up to the park, paid for parking, got out with the children - Sam barely 6 months old, walked about 50 feet from the van and turned around. That's right, we literally got back in our van and told our friends we'd meet them for lunch at Downtown Disney where we could stay inside buildings and keep warmer than walking the park. 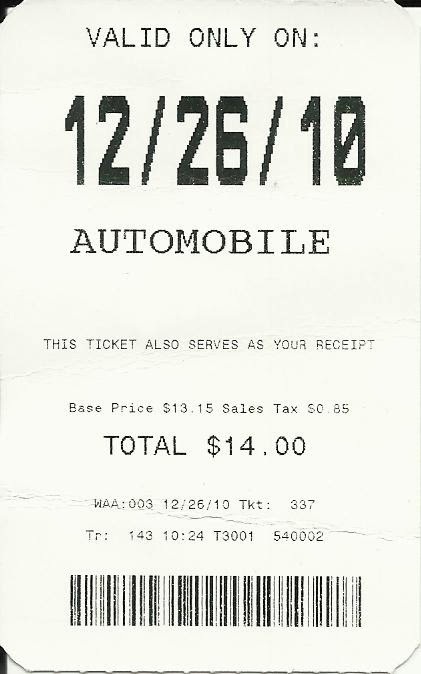 Here is our parking receipt for driving in and right back out! Despite the weather, we still had an awesome time! After our lunch rendezvous, we agreed to meet at a character hotel for dinner. This was one of those places where Mickey and his friends come out and chat briefly with you while you're eating. This ended up being a highlight of our trip! Charlotte was the perfect age to get super excited about the characters and never noticed what was left out of the day. The last photo was at my favorite restaurant Mimi's on the way back from Orlando.